Xia Xia Turks Hermit Crab is a toy created by a company called Cepia whose official website is www.cepia.com. These guys are amazing toy makers because these guys are also the same guys or mastermind behind the zhu zhu pets which are one of the coolest toys out there. You will have a fine Caribbean time with Turks the Xia-Xia crab. Every day is carnival day for the Xia-Xia Pets, crazy crustations from the makers of Zhu Zhu hamsters. The girliest of the Xia-Xia crabs, Turks is ready to start scuttling about when you give her claw a squeeze. 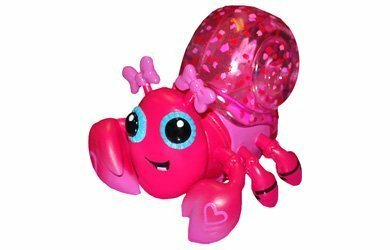 You can open her shell to reveal a little friend, swap it with other Xia-Xia crabs, and even fit her with an entirely different shell! (other shells sold seperately). Turks needs two LR44 batteries to get scuttling, which are included. Check out full range of Xia-Xia Pets crabs and habitats on Amazon (link on image).